The skin is often called the third kidney because it is able to eliminate toxic waste through the skin. The circulation in the body naturally moves toxins toward the skin for this very reason. The absorption of chemicals from contact with modern pollution can build up even more toxins in the skin. 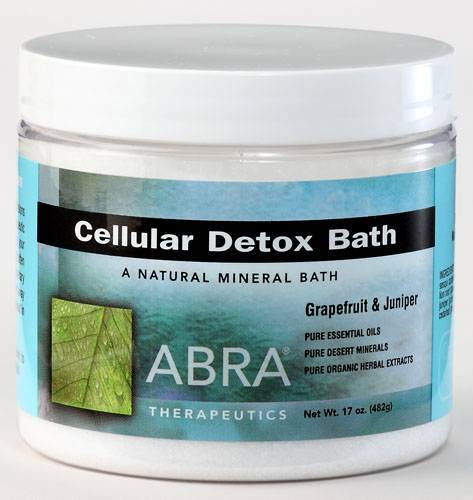 The ABRA Cellular Detox bath is made to help eliminate these toxins. Just as our body contains vital organs, so every cell in our body contains tiny vital organs called "organelles". When the skin cells absorb the active herbals and essential oils the organelles are signaled to release deeply embedded toxins, including free radicals. Free radicals are simply "free-floating" molecular bits and pieces that have broken off from another substance and are now looking for a new home. They can be from a thousand different environmental sources; organic, inorganic or artificial substances, but, they have one thing in common, a hook known as a "free radical". These hooks exist on an electron level and thus they attach to cells on an electron level. Depending on what they are and where they came from they can create a huge array of cellular health problems. Our modern chemical age exposes us to many new chemical signatures. The Cellular Detox Bath is an essential therapy for the recovery of health and wellness of the cellular body. It is especially valuable for people with regular smog or pollution exposure, people who are not active enough physically, and people recovering from short or long term illness including drug treatments and addictions.